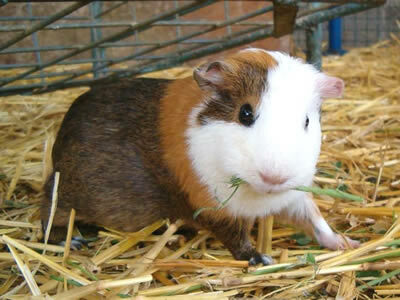 Hay forms an essential part of your guinea pigs' diet; without it they can quickly become ill. Guinea pigs like to chew on hay all day long, around the clock, so it's essential that you provide them with a constant supply of clean, fresh hay. Fresh grass is less important, but contains several important vitamins and minerals, and so is an excellent addition to their diet when available. Feeding your guinea pigs hay has numerous advantages. Perhaps most importantly it helps them regulate digestion, ensuring that their food is processed properly. Without it, your cavies can develop stomach problems such as diarrhea. Hay is quite abbrassive, and helps your pigs to keep their teeth ground down to a comfortable length. Unlike humans, guinea pigs' teeth grow constantly, and without a way to keep them short, they can grow too big for their mouth, making eating difficult and painful. Hay has numeroous health benefits, so make it a priority to include it in your guinea pigs' cage. Image by FreeNaturePhotos. Guinea pigs also like to use hay as a bedding material. Although they don't build nests like other rodents, they do like to have something soft to lie on. As a double bonus it also provides them with something to chew on if they wake up wanting a midnight snack! 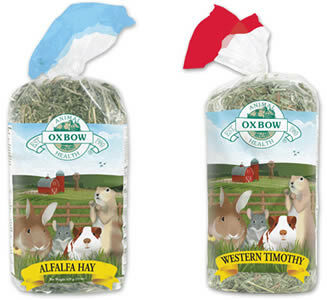 Hay comes in two main types - Alfalfa and Timothy. Alfalfa has a higher calcium content and so is better for growing pigs and pregnant sows, who need more calcium in their diet. However, in adults, an excess of calcium can cause digestive problems such as bladder stones. Alfalfa hay (left) is more suitable for young pups and pregnant sows. Adult guinea pigs should be given Timothy hay (right). Timothy hay is more suitable for adults as it has a much lower calcium content than Alfalfa. You should switch your cavies to Timothy hay once they stop growing, typically at around 12 to 14 months old. Most pet stores sell pre-packaged hay which does the job perfectly well. Be aware that some shops are not fully educated in guinea pig care, and might try to sell you Alfalfa hay for your adults pigs. A better option is to buy your hay in bales from specialist farms. Most will sell you a single bale at a time that you can store and use to provide your guinea pigs with a constant supply. Not only does this work out cheaper, it is also generally more nutritious than packaged hay. Don't be tempted to buy more than one bale at a time, as it can go off if stored for a long time. If your hay looks mouldy or begins to take on a sweet smell, this is a sign that it is no longer suitable and shouldn't be fed to your animals. A hay rack will keep your guinea pigs' hay fresher for longer by keeping it off the floor of their cage, protecting it from becoming contaminated and soggy from urine and spilled water. However, guinea pigs require lots of hay, and some racks are too small to cater for this. If you would like to use a rack, but find it doesn't hold enough hay, be sure to supplement it with some loose hay spread around the cage as well. 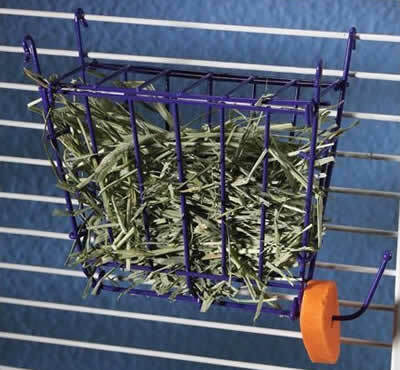 A hay rack keeps your guinea pigs' hay fresher and their cage cleaner. 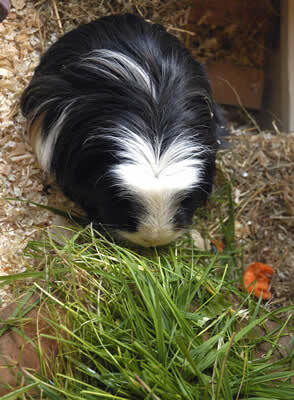 Fresh grass contains lots of vitamin C, and guinea pigs seem to love it, so it is well worth providing some if possible. It is most nutritious in the spring and summer, but contains few nutrients in the winter, so treat it as a seasonal supplement to their diet. Guinea pigs love to eat fresh grass, and it can be highly nutritious during the summer months. Image by Vertigogen. If you have access to a good supply of fresh grass, you should feed it to your pigs daily. Be careful when giving them grass from a meadow, as it may have been sprayed with dangerous herbicides. You should never give your guinea pigs grass which has been cut with a lawn mower - always pull it out by hand. Grass begins to rot very quickly, so don't leave it in your pigs' cage for more than an hour or two. Whatever they haven't eaten in that time should be removed and thrown away. An ideal way to get grass into your cavies' diet is to put them in a run in your garden. This way they can get some exercise and chew on some really fresh grass at the same time. It is also possible to buy bales and cubes of dried grass. This differs from hay in the way it is dried, and still contains some vitamin C, although not nearly as much as you find in fresh grass.